Maestro Jeffrey Tate and Michael Hammers, two artists collaborating to throw new light on Johann Sebastian Bach’s Mass in B minor in the Laieszhalle in Hamburg. Playing under the baton of their extraordinary chief conductor, the Hamburg Symphony Orchestra combined their playing with landscapes of light by Michael Hammers. The orchestra’s General Manager, Daniel Kühnel, had chosen an outstanding choir in the Gächinger Kantorei and selected star soloists Chen Reiss, Lydia Teuscher, Gerhild Romberger, Daniel Behle and Alastair Miles. The combination of music and light demanded everything from both the performers and the audience in equal measure. Why perform church music in a concert hall and why use light as part of the interpretation? 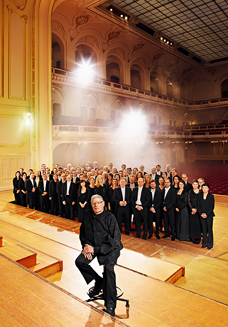 This performance by the Hamburg Symphony Orchestra was one of the concerts in the fifth phase of their Reformation Project, ‘The Nation as Identity’. The Reformation did not seek to divide, did not aim to destroy forms handed down across the centuries and, because of this, the tradition of church music with texts in Latin doesn’t come to an end with the Reformation. At the end of his life J S Bach, a Lutheran, set to music the Latin text of the Ordinary of the Roman Catholic mass, of those parts of the liturgy which do not vary from day to day. He did not place an all-embracing title at the top of his last composition for voices and he had died before the mass was performed for the first time; both of these duties fell to others to perform. It appears that J S Bach’s legacy to humanity is to make us sense through the experience of music the roots we all share, so that all confessional and religious boundaries, all intellectual barriers and limits linked to the medium or media employed are dissolved. He also does this to make each and every one of us recognise the one identity that gives meaning and purpose: that of a human being, of a nation, of a world community and of one of shared values.